As well as the development of infantry tactics, the Sengoku Period saw the evolution of the Japanese castle. 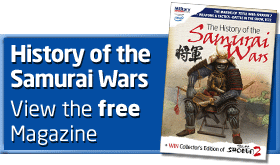 Throughout their history, Samurai warriors, as the elite warriors of Japan, lived in a style that reflected their superiority. From the farmhouses that dominated a village their influence grew and was reflected in the buildings they created. Magnificent castles, luxurious mansions, and the artificial simplicity of the teahouse began to characterise their built environment, until by the time of Toyotomi Hideyoshi, a ‘samurai style’ of architecture could be identified. Much of it still exists today. The most visible aspect of samurai architecture that may be seen in modern Japan lies in the handful of surviving castles. They rise up from enormous stone bases carved out of mountains and reinforced to give solid foundations. Above these mounds fly storey upon storey of graceful sweeping roofs and white defensive walls. Himeji castle is perhaps the best known of the genre. The keep that we see today was built in 1601, and even though many of the walls surrounding it have survived, much has been lost. For this reason, the visitor may be forgiven for thinking that Himeji is not primarily a military building. Yet it is in the intricacies of its defensive system that Himeji provides such a fine example of Japanese castle-building. The keep, now apparently so isolated and indefensible, was originally the centre of a vast array of interlocking baileys. Each successive space was defended cleverly by gateways, narrow passages, and walkways that required a visitor to turn round on himself several times before nearing his goal, all the while being kept under close observation from the defensive layer above. All along the walls of Himeji may be found small portals that allowed the operation of defensive weapons. There are square windows for bows, and triangular apertures for guns. Their arrangement within walls that looked like a series of folding screens allowed covering fire to be laid down in all directions. By contrast with Europe, however, there were few gun emplacements. The Japanese never really developed an artillery technology of their own, and the few large siege guns that were used at Osaka in 1615 were ships’ cannon obtained from European vessels. Nor were these guns even ‘wall breakers’: the stone bases on which the superstructure of the castles were built were so solid that the stone base of Hiroshima castle even survived the atomic bomb. Instead, the artillery bombardment at Osaka was directed against the living quarters of the castle, and when a lucky shot smashed through the wall of the room were the mother of Toyotomi Hideyori was sitting, the defending side were encouraged to open negotiations. The keep of Matsumoto, built in 1596, is one the finest surviving examples of ‘samurai architecture’.